“For the word of God is living and active, sharper than any two-edged sword, piercing to the division of soul and of spirit, of joints and of marrow, and discerning the thoughts and intentions of the heart” (Hebrews 4:12, ESV). The Hebrews writer reminds the Hebrew Christians about the faithless disobedience of the Exodus generation of Israel. He warns them that faithless disobedience does not go unnoticed by God. The Word of God acts as God Himself to expose one’s innermost thoughts and intentions. 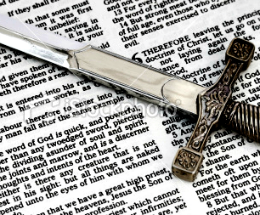 God’s Word is like like a razor-sharp sword that cuts two directions: coming and going . One side of the blade cuts as the blade swings away, and then it cuts again on the way back. So we cannot hide any thought or motive from God’s sharp Word. God sees what is on the inside and we are accountable to God for not only our actions and behavior, but for the motives and intentions influencing our behavior. Let us constantly examine ourselves by letting God’s Word penetrate our hearts and minds so that pleasing God becomes our primary motivation. “All Scripture is breathed out by God and profitable for teaching, for reproof, for correction, and for training in righteousness,” (2 Timothy 3:16, ESV). This entry was posted in disobedience, word of God and tagged Bible, word of God. Bookmark the permalink.